On Saturday, 16 August 2014, the Landmine and Cluster Munition Monitor for 2014 published a report about the use of cluster munitions in the world. In regard to Syria, The report relied mainly on coordinating and cooperating between the Monitor and the reports published by SNHR. The period covered by that report was from the beginning of 2014 until 4 April 2014. The report of our dear fellows in the Monitor showed that the number of victims killed by the Syrian regime is much more than the number of victims killed by Israel’s heavy use of cluster munition in 2006. SNHR documents and updates periodically the Syrian regime’s use of cluster munitions across Syria. 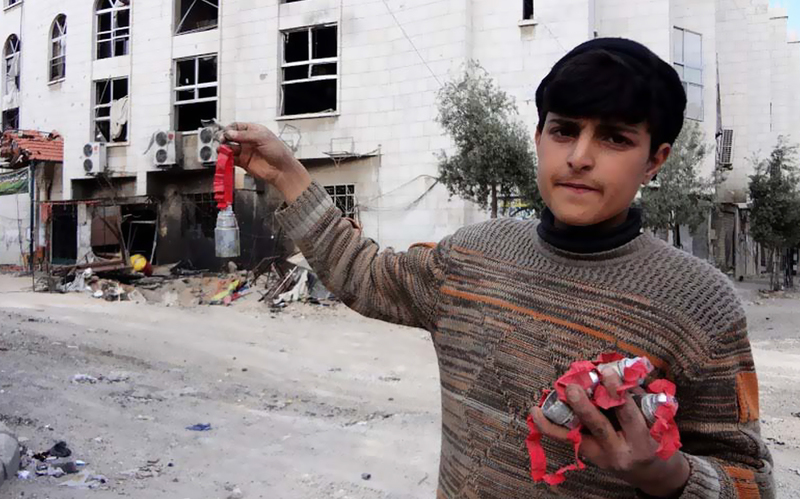 The Syrian regime have used cluster munition in 2014 far more times than the previous years. 2014 is the worst year concerning the use of cluster munition since 2009. In 2014, SNHR documented no less than 83 attacks that were carried out using cluster munitions from the day of the first attack was on 25 January 2014 to 21 September 2014. Those attacks killed directly no less than 49 people, including only one rebel only, 47 civilians, 16 children and four women. Also, 250 injuries were caused by cluster munitions. While the remnants of those munitions caused the death of 15 people, half of them were children (seven children in addition to three women). In total, 64 people, including 30 children and women; thus 50% of the victims, who were killed by cluster munitions, are women and children and 98% are civilians. Aleppo governorate: the Syrian regime used cluster munitions in no less than 34 attacks to target about 23 points. On one day, Tuesday 18 March, the Syrian regime used cluster munitions against four civilian neighborhoods: Sheikh Fares, Sheikh Khader, Boa’ydeen, and Bustan al-Basha. Those attacks killed 22 people including 21 civilians, six children, and a rebel. Hama governorate: the Syrian regime used cluster munitions no less than 18 times, most of which targeted Kafarzita city (11 attacks). 16 people including eight children and two women were killed in thise attacks. Idlib governorate: the Syrian regime used cluster munitions no less than 11 times to kill seven victims including one child and woman. Daraa governorate: the Syrian regime used cluster munitions no less than nine times to kill two victims including one girl. Damascus countryside: the Syrian regime used cluster munitions no less than five times, three of those attack were against Yabroud. One victims were killed. Homs governorate: the Syrian regime used cluster munitions no less than three times, two in Rasatn city and the third in al-Wazaye’ah village. Qunaytrah governorate: the Syrian regime used cluster munitions once in Swaysa village.